Since poison ivy is wild, it grows that way. Depending on where you live, you may have problems with poison ivy control. You may have large patches that seem to spread every year. So before it takes over your yard, you may be trying to figure out how to deal with it. Dealing with poison ivy is difficult. But there are ways to keep it at least under control, if you can’t get rid of the plant entirely. So first identify that the plant is actually poison ivy, then around May through July take care of the problem. The best means of poison ivy control is to spray the plants. As mentioned in the above paragraph, May through July is the best time to do this, even though you can attempt it throughout the year. Roundup and other products that include glyphosate are good for poison ivy that’s within arm’s reach. Be careful when using these or any herbicides. Follow the instructions on the labels and be very selective with what plants you spray. These products don’t know what to kill and what not to kill. So spray carefully and not so much that it’s dripping off the plant. You can control climbing poison ivy with sprays as well. But your approach will be a little different for this type of poison ivy control. You’ll need to cut the vine about six inches above ground and spray what’s left with Roundup or another herbicide. This will destroy the roots and therefore kill the plant. If it does start to sprout again after you’ve done this, spray the new growth with the poison ivy killer as well. Poison ivy can spread rapidly and persist despite being sprayed. Check on the plants you’ve sprayed and repeat the process if they still seem to be growing. You may need to do so two or three times. You can also help prevent the growth of new plants by spraying them when they’re young. If you’d like to avoid spraying, there are more organic means of poison ivy removal. However, it does require more effort and may take longer to accomplish. The most basic means of controlling the plant is to put on a pair of gloves and rip up the poison ivy by its roots. This may be enough for just a plant or two in your yard. Soak the ground around the plant first to make getting the entire root system easier. You want to avoid leaving any of the roots behind. Then get rid of the plant by wrapping it in plastic and throwing it away. For larger areas of poison ivy, try covering the plants with thick material or multiple layers so sunlight can’t reach them. This method may take about a year to complete. When they’re dead, rip them up and toss them. However you choose to maintain poison ivy control, be careful when exposing yourself to the plant. Wear gloves and don’t touch bare skin or your eyes. And don’t dispose of poison ivy by burning it. The toxins can be inhaled as well as rubbed on, causing a hideous rash. 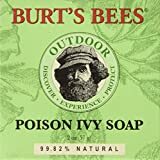 Poison Ivy Soap That Works! What Causes Poison Ivy Blisters?